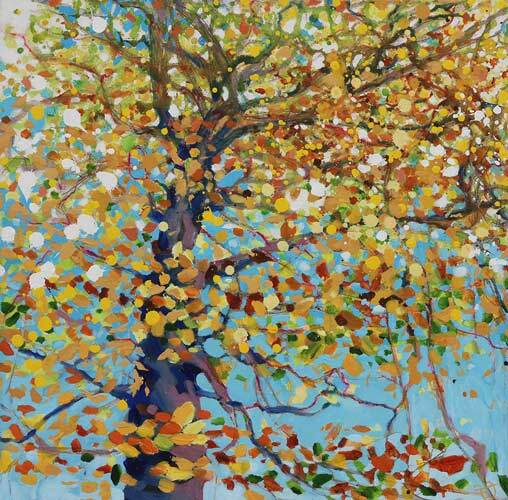 Living Leaves is a painting reflecting the close relationship between Trees and Humans. Both humans and trees stand as vertical ‘figures’ within the horizon, transmitting nutrients up and down our skeletal cellular superstructures, defying gravity through xylem vessels that connect roots to canopy or capillaries in our circulatory systems. The pink and blue curving shapes in the painting resemble oxygenated and de-oxygenated blood travelling around the networks of our bodies. At a microscopic level our brain cells resemble tiny trees or fungi branching across thousands of routes. I find the many similarities and patterns between branching networks in living systems incredibly beautiful; in this case aorta resembling the trunk, the arterioles and venules the branches and the capillaries the twigs, the lungs mirroring each other from the trachea as the tree’s branches are mirrored in their roots. Considering that plants provide oxygen and glucose for both themselves and the entire animal Kingdom globally, our dependence and relationship with them is a powerful metaphor for environmental thinking.